Like the evolution from single-celled life to multicellular lifeforms, so too is the landscape of cryptocurrency changing. Bitcoin, progenitor of all coins, developed from a set of mathematical conditions and technological fine-tuning to survive as a durable transactional entity, and was an inspiration for the varied cryptocurrencies and distributed technologies that followed. Ethereum, assimilating some key features of Bitcoin and evolving new traits of its own at the cost of certain properties, has grown to become another worthy leader in the crypto space. All that has passed constitutes the earliest eras of blockchain technology. The mechanisms and means for cryptocurrencies to gain legs and globalize adoption is the work of this current time period. Scaling solutions, alternative choices to blockchain, and decentralized exchanges all work side-by-side to allow greater liquidity, freedom of trade, and capability of use – all necessary developments if blockchain technology is to take over the world, as it is often projected to. Decentralized exchanges in particular have a lot of potential to help the market thrive. They ease the process of trading, eliminate several security concerns, and make exchange between any and all coins a possibility. The latter is, in fact, its greatest advantage. With an exchange running on distributed ledger technology, I could trade with you for any coins you hold without ever having to pass through the liability of a third-party exchange. You could hand me a dollar for my 61 rupees immediately, and, in the case of cryptocurrencies, the exchanged tokens could be traded and used anywhere, rendering government regulation almost entirely powerless to put a stop to it. It is this peer-to-peer nature that makes decentralized exchanges so valuable. Centralized exchanges, as the name suggests, involve a supposedly trusted central entity that performs the operations on behalf of its customers. The trouble with this is that this entity is an ideal target for malicious attacks. It holds the credentials and funds of all its users, which makes it vulnerable. If this entity is breached, the funds of so many are lost. However, in a decentralized exchange, this weak point does not exist, as the exchange mechanism is not based in any particular location, entity or server. It is a widespread network where, if one or two parties are compromised, the others remain unaffected. Server downtimes also no longer become an issue. The lack of an owner, i.e. single point of control, makes it resistant to government censorship and taxation as well. We’ve covered the advantages and particulars of decentralized exchanges – DEXs in short – in our guide to decentralized exchanges. Here, we’ll take a look at the 5 most popular and reliable decentralized exchanges that you can use at this very moment, or in the near future. In selecting our picks, we have kept in mind that these exchanges must have a decent amount of liquidity and volume, coin support, and a good number of features. The Waves Decentralized Exchange is a major component of the Waves project, which focuses on making it easy for teams to launch their own ICOs and cryptocurrency projects. In April 2017, Waves launched its DEX. Users can trade Bitcoin and Ethereum for the Waves token, or any other token supported by the exchange. These others coins include Zcash, Litecoin, and any coins built on the Waves platform. The platform also incorporates TradingView charts, which is a handy feature for serious investors that offers a fiat gateway for various fiat currencies. The total 24-hour trade volume on Waves DEX is just above $400,000 at the time of writing, or about 60 BTC. Naturally, Waves, Bitcoin, and Ethereum account for most of the volume. To use the Waves DEX, simply log on to their platform or use their web wallet, waveswallet, and make an exchange through the exchange tab. Stellar, a project with its eye on remittances and micropayments, like Waves, also advertises its DEX as a major part of its platform. Called SDEX, this exchange was launched in October 2017. Cryptocurrencies supported by SDEX are Bitcoin, Ethereum, Ripple, Litecoin, as well as some fiat currencies, including the US Dollar, Japanese Yen, Chinese Yuan, and Hong Kong Dollar. SDEX also offers atomic pathfinding, which means that it automatically finds the cheapest asset trading pairs for your convenience. At the time of writing, the 24-hour trade volume on the SDEX was roughly $366,000 or 53 BTC. The recently launched Mobius coin accounted for over half of the volume. To trade on the SDEX, visit Stellarterm, register, and make an exchange. 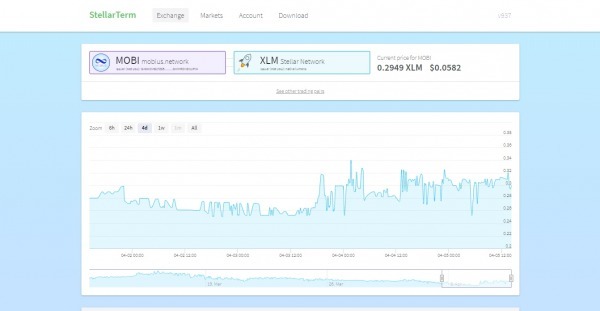 You will have to deposit 20 Stellar Lumens (XLM) to begin trading. IDEX is one of the most popular decentralized exchanges in use. It was launched in September 2017 and supports the largest number of tokens by far – over 200. It also has a signed strategic partnership with the WINGS foundation, and any ICO launched through the latter will automatically be listed on IDEX. IDEX only supports ERC-20 tokens. IDEX has a simple and intuitive interface that makes trading easy from the get-go. 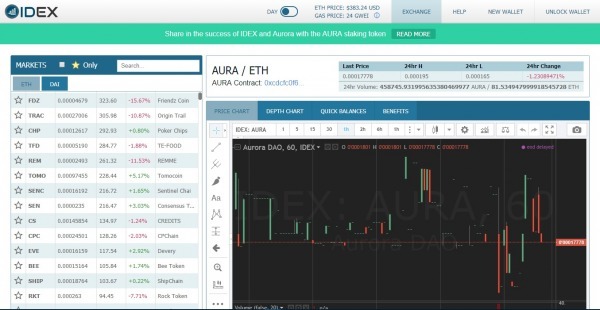 If you’re looking for the greatest trade possibilities from a DEX, you can’t go wrong with IDEX. However, unlike some of the other DEXs, you have to deposit coins to the exchange – you can’t trade directly from a wallet. For a measure of security, though, it is possible to use IDEX with MetaMask and Ledger Nano S. As we’ve mentioned before, hardware wallets are a good choice if you want to keep your tokens secure. Additionally, there is a staking program that allows you to stake the exchange’s token and earn a share of the fees generated from IDEX. Its reputation is validated through large trade volumes. The 24-hour trade volume for IDEX is over $2 million or 321 BTC. You can begin trading by visiting the IDEX Market. It would be useful to list and categorize the various DEXs based on the 0x protocol. This protocol has been designed with decentralized exchanges in mind, powering the exchange of ERC-20 tokens while being open and permissionless. Several projects are already utilizing it, including Maker, Aragon, Status, Augur, and Radar Relay. The full list can be viewed here. 0x works by shifting trade orders off-chain, which incurs lower gas fees and less strain on the blockchain network. Orders are broadcasted over the network and a “relayer” (who can be anyone) is paid for facilitating a trade order. Furthermore, 0x will provide dapp integration for dapps that need exchange features. This should be a useful feature for cryptocurrencies as practical real-world applications are built in the coming years. Another noteworthy feature is that all relayers make use of a standard API, allowing them to expand their liquidity pools and grant greater trading options. Among these endeavors, we’ll list Radar Relay, because it has been well received and certainly fits the aforementioned criteria. Radar Relay is not so much an exchange as it a “relay.” A 0x relay facilitates orders on 0x. When an order is complete, it is settled on the Ethereum blockchain using 0x smart contracts. For a more detailed description of the platform, take a look at their blog. No signups or deposits are required. You can trade directly from wallet to wallet. It also supports both MetaMask and Ledger Nano S.
The 24-hour trade volume on Radar Relay is roughly $135,000, or just under 20 BTC, at the time of writing. If you want to make a trade, visit the Radar Relay application. MakerDAO has recently launched their decentralized exchange, OasisDEX, which currently only supports Ethereum, DAI, and MKR. This may call into question its place on this list, but it has been included because there is strong commitment from the team to include many more ERC-20 coins and Bitcoin support as well. At the time of writing, OasisDEX has a 24-hour trade volume of over $750,000, or 112 BTC, most of which is Ethereum. To use this exchange, you’ll need a MetaMask account, which is a useful thing to have in and of itself. Once you’ve registered and unlocked your account, you’ll be able to use this DEX. Do you use decentralized exchanges to trade crypto? Share with us your fave DEX!